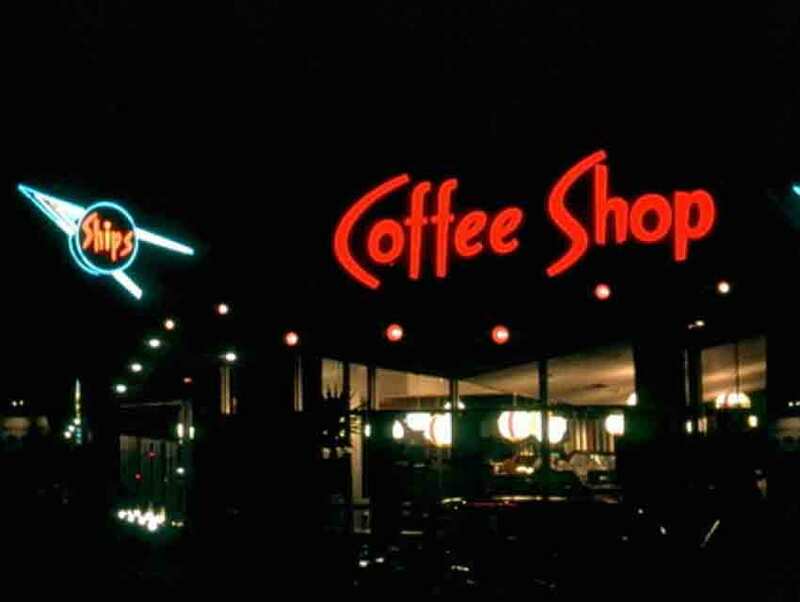 Emmett Shipman opened the first Ships Coffee Shop in Culver City in 1956. Architect Martin Stern, Jr. designed that building and the second Ships, which was in Westwood, too. The Googie kings at the architecture firm Armet & Davis designed the chain’s third and most popular location, which was constructed next to a 76 station on La Cienega Boulevard at Olympic in 1968. Both locals and tourists loved Ships. The restaurants served 50 million customers from 1956 to 1996, and I was one of them. Because there was a toaster on every table, Ships always smelled of burnt toast. Preparing your own toast of choice was the main event, and I spent countless late nights pushing rye bread into their clunky appliances. Ships also had the best freshly squeezed OJ, chicken pot pie, and mashed potatoes in the city. A big fan of Googie architecture, I spent many hours at the Westwood location. I even used the phone booth in the parking lot to call and meet up with friends in the Village. That Ships was huge with UCLA students, but I often spotted TV writers drinking coffee there, pencils and yellow pads at the ready, too. I saw science fiction buff and Famous Monsters of Filmland editor Forrest Ackerman at the counter once and actor-producer Danny Thomas was a morning regular. On one very memorable evening, I took Larry “Wild Man” Fischer, an underground singer-songwriter discovered by Frank Zappa and popular with Dr. Demento listeners, to the Ships on La Cienega for a Ship Shape Hamburger. He was completely enamored with the burger’s ship-shaped bun. All three Ships locations shuttered by the ’90s, and their spellbinding structures eventually were demolished. A 20-story office tower replaced the Ships in Westwood. An auto repair shop replaced the Ships on La Cienega. (Although you can still see remnants of the diner’s marquee, which featured a design resembling a lightning bolt. Now the sign says MATRIX and the lightning bolt has bolted for good.) A strip mall replaced the Ships in Culver City. Thankfully, the chain was forever preserved on celluloid for the 1985 film Into the Night. Now that Ships has sailed, I’m saving a small piece of its history, too: a rare menu that I recently won on eBay. Holy Ships, check out those prices! Previous articleL.A. Is Making a Big Push to Curb Homelessness. Will Small Houses Play a Role?